You can attend a real money seminar at a discounted rate of P1,000 if you register and pay before October 24. 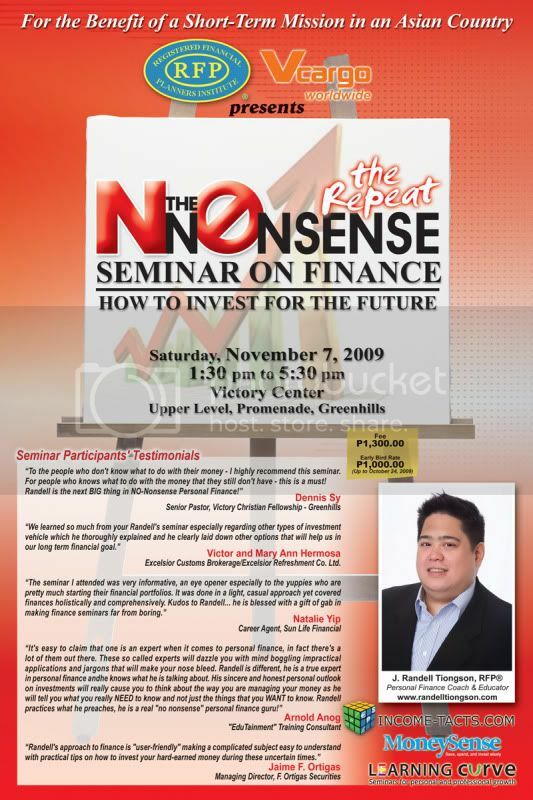 The No Nonsense Seminar on Finance: How to Invest for the Future — the Repeat! If you attend the half day seminar, you will get a very good understanding on the concepts of Investments and Investment Planning plus a healthy discussion on available Investment Instruments in the country today. While many money seminars are good, most are just generalities that offer little practical and instructional value. The No Nonsense Seminar on Finance is different as it is comprehensive and yet still easy to understand. Before letting go of your money, improve on your financial acumen — it’s one of the best investments you will ever make. A lot of people are teaching on money. It’s good to learn from the teachers. But Randell will be talking about finances. It’s better to learn from an expert. I would.